I like to be comfortable and there is no shame, in my comfort game. As I write this I’m eating lunch in my living room and wearing my LuLaRoe unicorn leggings. 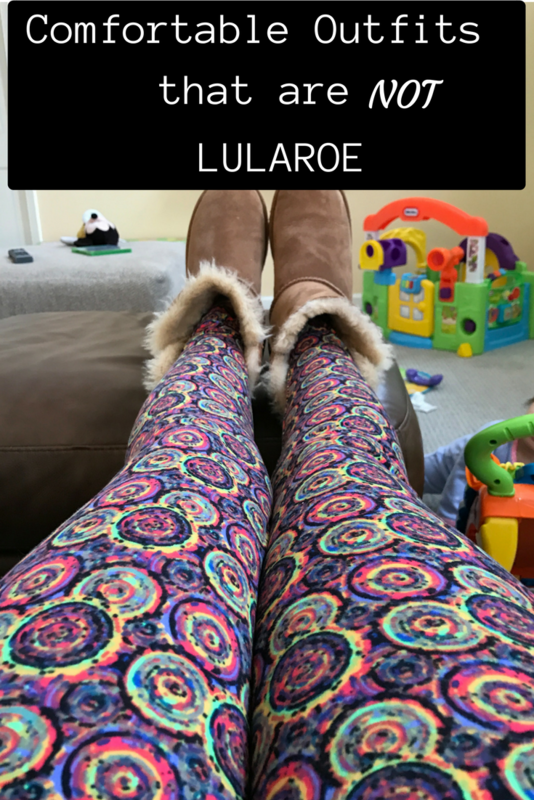 Leggings have been my go-to comfortable pants staple for a few years but last summer when I caught the LuLaRoe bug, it was a game changer. Suddenly my drawers were overflowing with wild patterned leggings, bright colors and everything from watermelons to unicorns. I have a closet full of Gracie’s, Julia’s, and Classics. I love how comfortable and versatile the clothes are. It’s so easy to throw on a tee-shirt and some leggings and go about my day. And realistically it’s not like I’m going anywhere other than the park, music class or to get coffee with a friend. My life doesn’t really require pants with buttons. However sometimes my life needs pants with buttons because leggings don’t let you know when you’ve put on a pound or two, leggings don’t hold you back when you go for seconds at dinner and let’s be honest leggings don’t always look pulled together, no matter how many online groups tell you otherwise. Sometimes you need pants. But real pants and outfits don’t have to be uncomfortable and can be as comfortable as leggings. 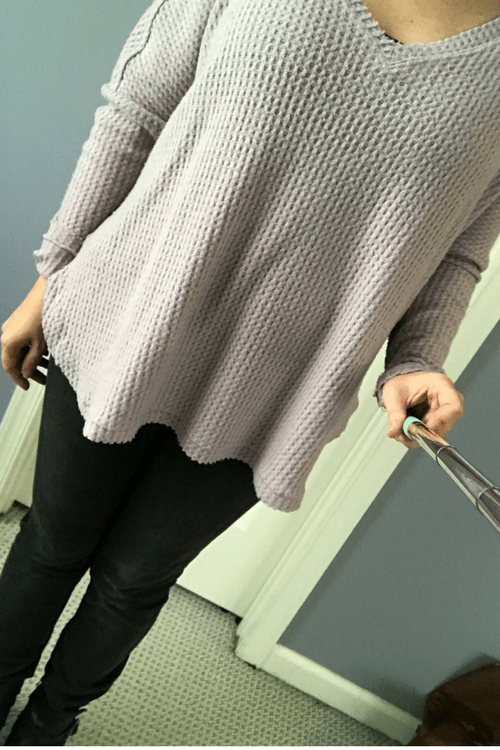 These are my favorite comfortable looks that don’t involve LuLaRoe. Urban Outfitters is one of my new favorite places to shop. I like Urban Outfitters because they generally offer free shipping, free returns and many of their tops are flowy. Here I’m wearing a lavender sweater from Out From Under. It can be worn with black leggings, here I’m wearing it with my black Pistola skinny jeans and black booties. 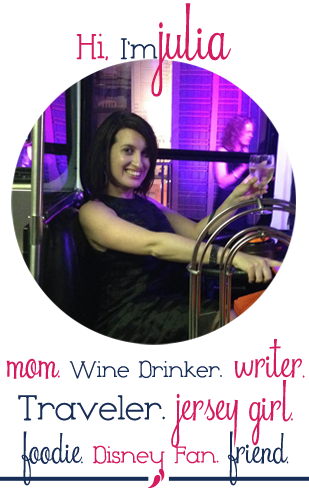 The sweater is also perfect for nursing moms and you can comfortably wear a nursing tank top underneath. I have started helping my husband with his business and I had to go to his office for a few hours one day. We mostly got my email password and then went to lunch. I wore this combo of boyfriend jeans, sweater and UGG boots. The sweater is from Old Navy a few years ago and underneath I layered a white tank top underneath. The jeans are boyfriend jeans and I highly recommend everyone get a pair because they are the most comfortable style of jeans. So I’m breaking the rules here for this next look because this oversized sweater just screams “wear leggings” with me. 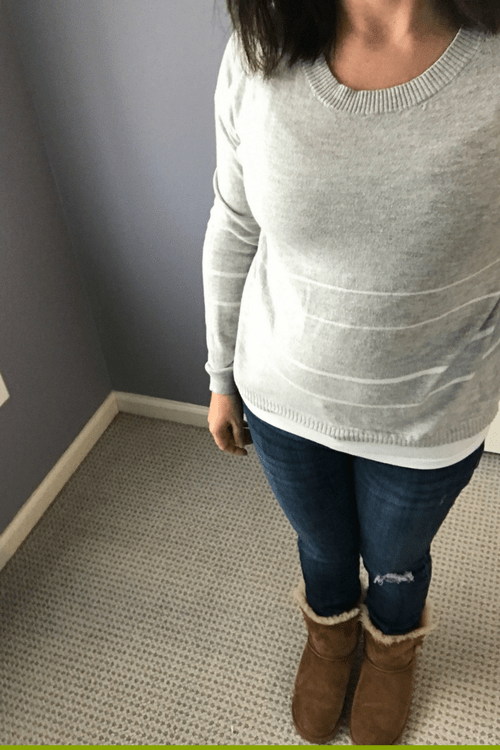 I love how warm and cozy this sweater is and it is also a great sweater if you are nursing. 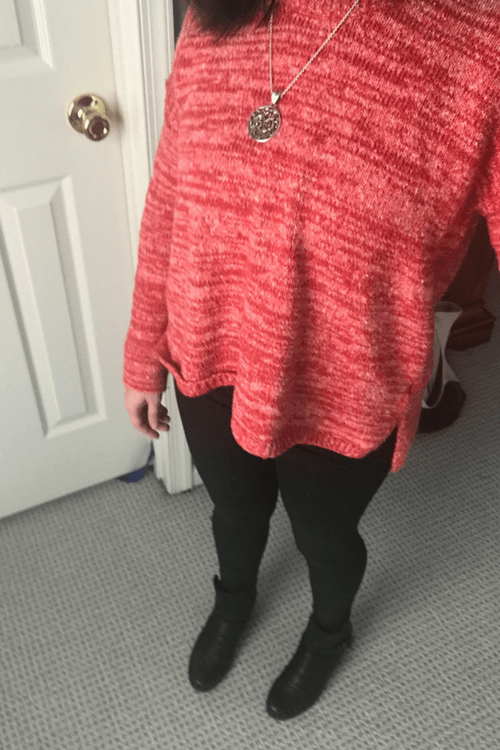 Leggings are LuLaRoe black leggings (why are these so hard to find) and the sweater is from Urban Outfitters. Lately I’m all about cheeky tee’s and sweatshirts. 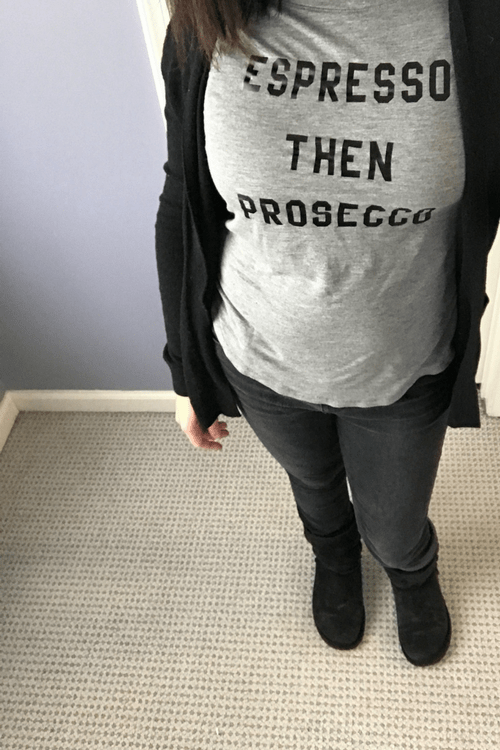 I have “Coffee till Cocktails” and “Rose All Day ” and this gem “Espresso Then Prosecco ” . I haven’t found a good drink themed shirt I don’t like. I paired it with jeans and a black Gap cardigan. Gap is my go-to for basics (think tees and cardigans). I love basics and when I find a good one I buy in bulk. I love blanket scarfs but since I’m nursing they aren’t the most sensible fashion option but they really can pull an outfit together and keep you warm. 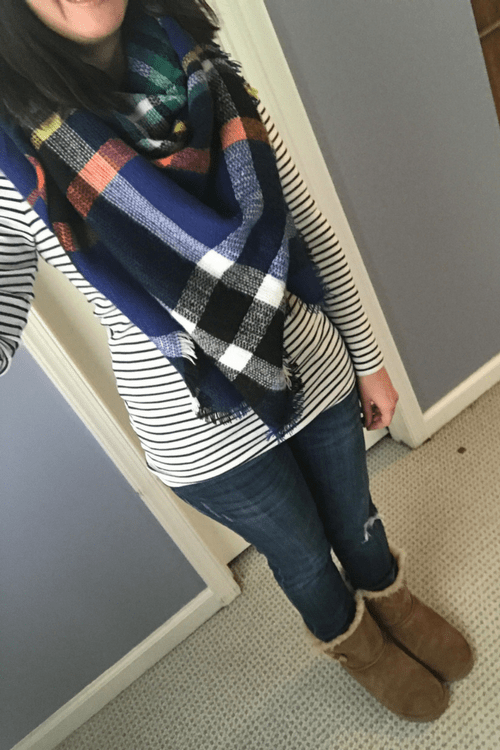 I had a day out without the kids and I wore a striped top from Gap, Blanket Scarf , boyfriend jeans and my UGG Boots . In case you’re wondering I test drove all these outfits and if I could spend the whole day in the outfit including playing on the floor with kids, then I knew it was a keeper. Jeans with a lot of stretch work well for crawling around on the floor with kids or for wandering the super market in search of the one thing you keep forgetting. Flowy tops are flattering on everyone. My go-to looks are a billowy top and a more fitted bottom, similar to the much-loved LuLaRoe styles. I love my LuLaRoe but it is also nice to put on jeans and feel pulled together and still be comfortable.